While on a business trip to Cebu, we stopped at a makeshift/roadside vendor with pomelos on offer. We bought one to try and back at the office I peeled it and was pleasantly surprised to find a robust, juicy and sweet pomelo, all for just PHP50 per piece, roughly 1/3rd the price of pomelos in Manila, and the latter were extremely erratic. So a little later the same day, we bought 15 kilos of pomelo to bring back to Manila as checked-in baggage. Key ingredient number one, check. Next we acquired some medium sized suahe or pale shrimp, brined them for an hour before blanching them in boiling water for 2-3 minutes then taking them out, and peeled when cool enough to handle. I also chopped up some of the roasted peanuts we made at home. I chopped up some home-dried coconut. Got some kaffir or makrut lime leaves from the garden, a few leaves of sawtooth coriander and some mint leaves from the fridge. Also boiled some chicken breasts and shredded the meat. I made a modest amount of dressing from dayap juice, and yes, it must be dayap or key lime or Vietnamese/Thai/Indonesian lime or don’t bother, some brown sugar, thai patis, a bit of water and come chopped red chili. If you have thai fish paste a little of that would also be nice. Mix this all up and get ready to assemble your salad just minutes before you serve it. Yummy! shared a tip for you regarding frying of shallots. 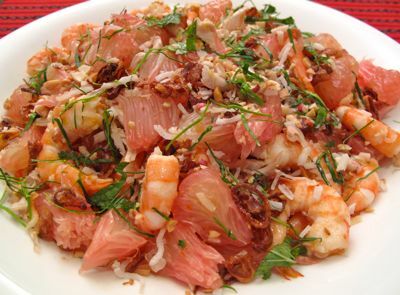 This is one thing (Pomelo salad) I long to do but keep on postponing it. other than this my other favorite is the simple green mango salad with patis and sugar sauce. It’s a hit pair with any fried stuff. Thank you for the recipe, MM. I saw some pomelos at the Asian store the other day. 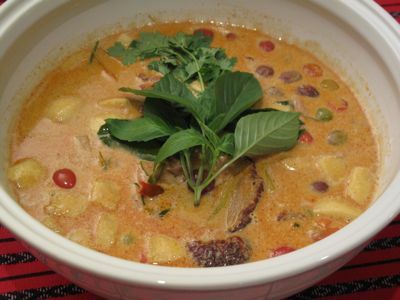 I hope you are posting your Duck in Red Curry recipe, too! I agree you need your ingredients fresh here + the effort to do this…so we just order our fave Viet pomelo salad from Pho Hoa :D Thanks for the resto suggestions too! I just came back from a visit in Pinas, and one of the places I went is SM Manila. It was lunch time when we got there, and first place that interested me to eat is in Pho Hoa. Golly, the price was enormous for my budget (I had my relatives with me), and so we went to the food court instead. I am so spoiled with the Vietnamese and Thai restaurants here in Texas – their prices are so cheap. 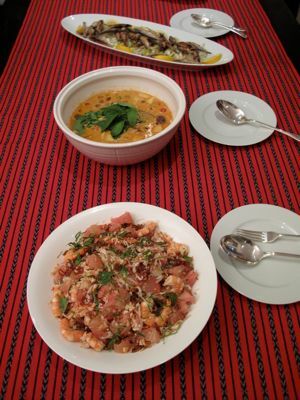 And this PomeloSalad is one thing I can replicate nicely for all the ingredients are available in the many oriental stores around. Everthing can be bought fresh, including the lime, cilantro, and the pomelo) there’s 3 kinds in season right now. I am going to try the bloody orange too.. my taste bud says its going to be ok. 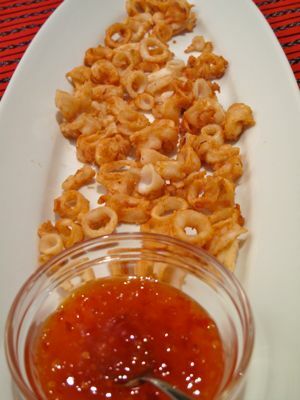 I have to say that this appetizer is simple to do but it’s surprisingly good. Next the Red Duck Curry! 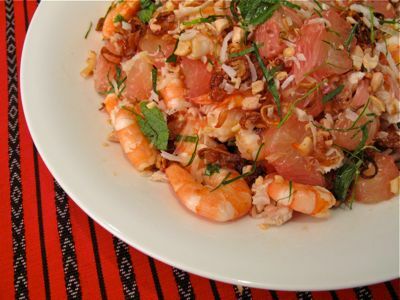 Shrimp and pomelo – that’s freakin’ genius. Who would ever thought? I must try with my own spin. I am fan of thai food but always fail to find the true ingredients, can you tell me where to find kaffir lime leaves? Would you know where I can get some kaffir lime plant? Mheann, you can buy the plant at the Manila seedling bank, or sometimes at weekend markets. You can get kaffir lime leaves at the herb section of Rustan’s and S&R sometimes. Also, Fresh Fields in Market!Market! often carry kaffir lime leaves. If you do find them and don’t use all of them, freeze the remainder. Its not the best solution but better than no kaffir lime. The defrosted leaves are best used in soups and curries, not sliced fresh for salads.